01 July 2015: Car Boot Success! For a whole week I watched this apparently unnoticed piece of art on eBay, with hardly any bidders. I left myself a reminder to bid, by my computer. Monday 9:12pm came, and so did the palpitations! I always get a racing heart whenever I attempt to snipe! But snipe I did with 40 seconds to go…arghh…did I bid too soon? Have I given the other bidders time to get in there….better, quicker, more wily snipers? Afterwards, I sat there with my hands shaking, I didn’t know if I was relieved or slightly disappointed that no-one attempted to bid again in the last few seconds, bumping up the final price! But (as usual) I got it at a bargain price. Why didn’t more people notice this…why didn’t people see what I saw? Just the title alone caught my imagination! Being a lifelong admirer of medieval art, I was initially struck by the design of the front panels (see pics below). It looked so old from the outside. 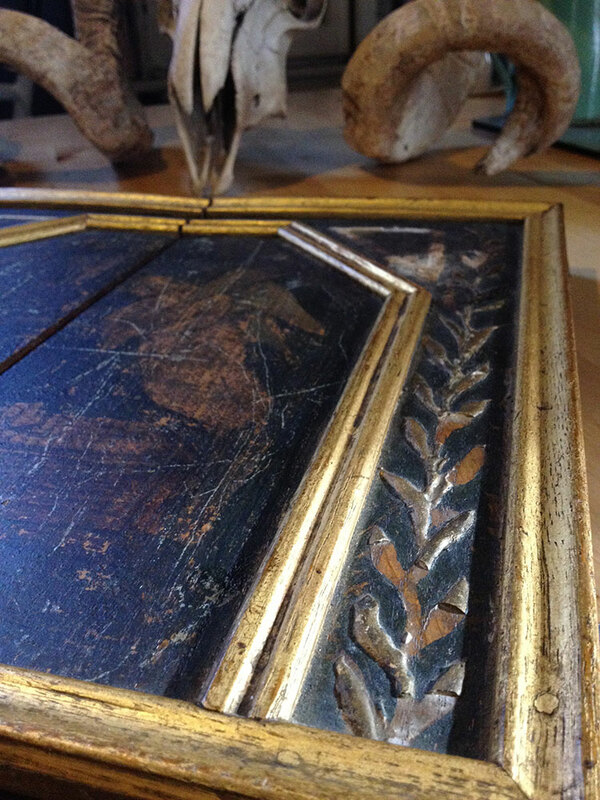 The framer was evidently emulating a medieval style. Intriguing. It had predominantly black painted oak panels, gilded (albeit crude) stucco elements, bordering a central image with a religious theme, which had definitely seen better days. I recognised the damage to the black paint instantly. I’ve seen this often in old paintings. Artists used bitumen to enhance the intensity of black paint. A common filler, but it doesn’t age well. Over time it oxidises, swells and eventually cracks and blisters. 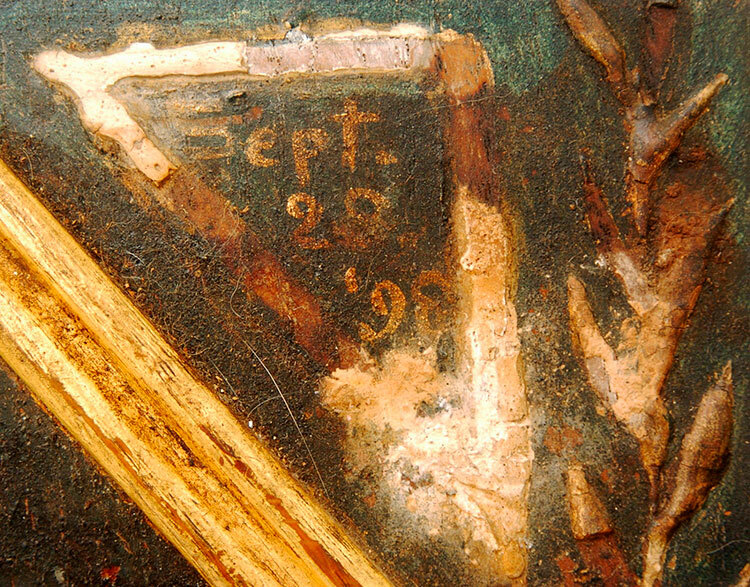 So severe can the damage be, it can give the impression the painting has been in a fire. It can ruin a painting, but mostly I find it gives quite a pleasing distressed effect. It adds age and interest. But it has almost obliterated completely the external image here. You can just about make out a devotional scene of an angel on the right, hovering over a kneeling praying figure. Oddly, there are no remnants of paint on the figures themselves, just a (pencil?) drawing straight onto the wood. Upon opening the panels we find more wonders. 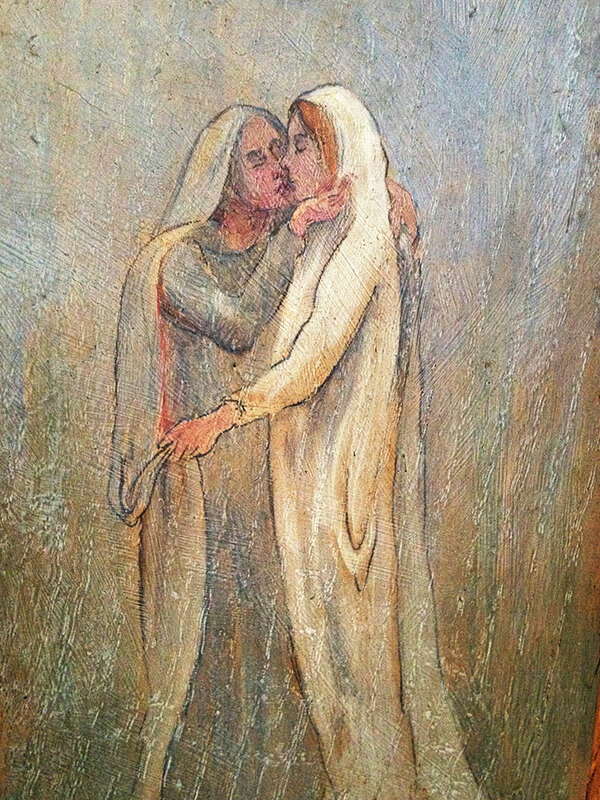 The inside of the left side panel depicts a couple embracing. Possibly a person being welcomed into heaven? 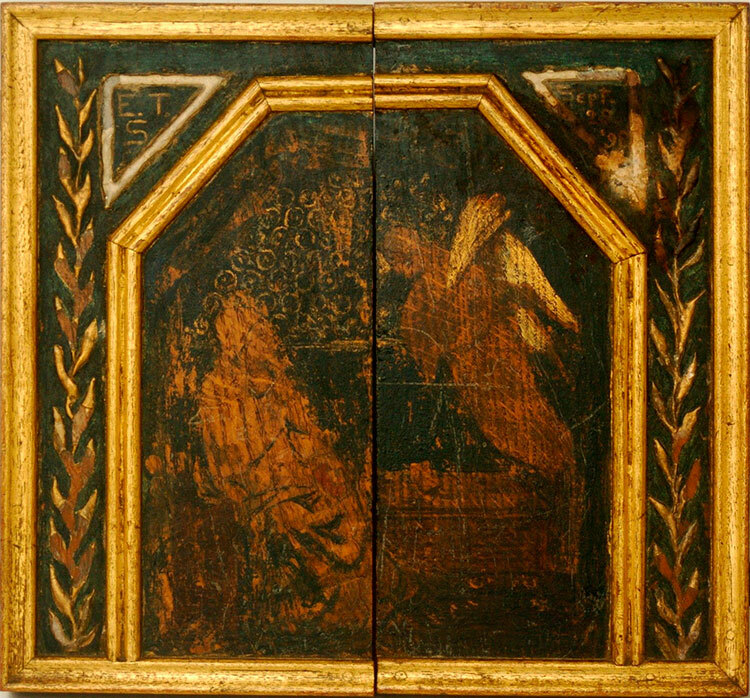 The other panel bears the Madonna and child. 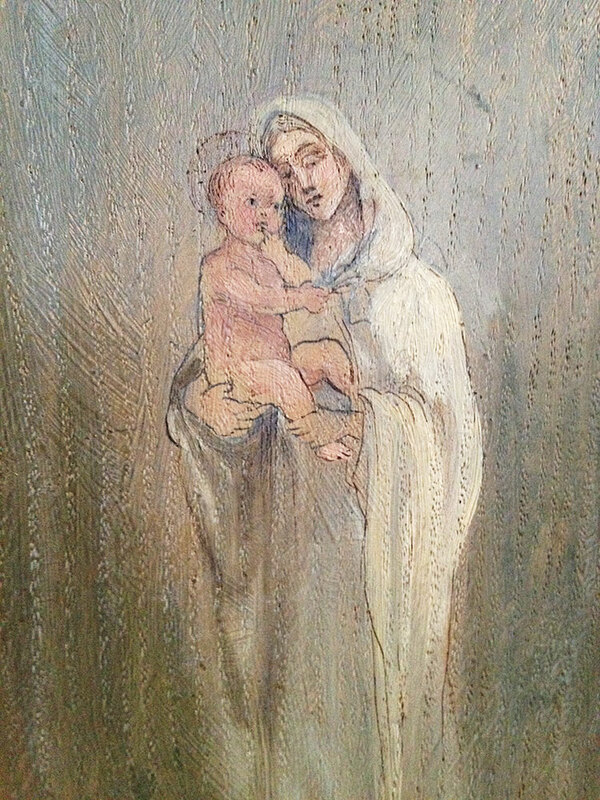 They are both loosely painted straight onto the un-primed oak panels. Medieval themes were a favourite among Victorian painters, and the inside art is clearly from the Victorian era. In fact, the style looks very familiar to me. Could it be what my gut was telling me? 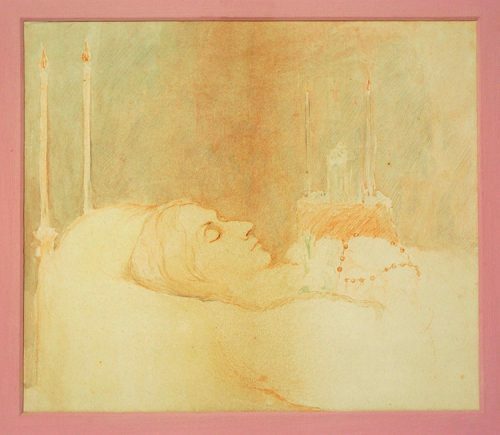 In between the panels there is a drawing portraying a woman, on what appears to be her death bed. It is a Memento Mori (Latin for “remember that you will die”). Drawing or photographing a person shortly after death, sitting up, or even posing alongside other family members, was not deemed morbid by the Victorians, but was as much commonplace as recording a birth or marriage. Premature death was a regular occurrence. So many epidemics to die from! So common, that they had a totally different outlook towards death than we do today. In fact, a bereaved Queen Victoria made mourning fashionable. It’s difficult to put an age to the woman in this particular memento mori, as her face is void of detail. An outline almost. Is she a young woman taken too soon by one of those romantic Victorian illnesses? Or is she an older woman, idealised by the artist, as that is how they saw her? Portrayed forever young. She looks at peace. There is no sign of suffering, or evidence of a long drawn out illness. In fact she actually looks healthy. Is that a gentle smile on her lips? The slightly sunken eyelids betraying only a hint of death. There is an overall sense of calm and serenity. An attempt to normalise what would otherwise be a distressing occasion? The sepia drawing is done so delicately, so tenderly, it feels as though it would fade into nothingness if exposed to the light for too long. The fragility of the sketch symbolic of the transience of life, and how quickly it can be taken away. I’m guessing this is why it is presented in a triptych. The panels protect the precious memory hidden inside from the elements. I think, someone very close to the deceased painted this as a sign of their devotion. Was this woman perhaps their partner, mother or sister? It certainly feels personal. The lightness of the strokes, and just a hint of a pale watercolour wash over the drawing, evoke tender, sentimental emotions. There is also a sense of urgency in the drawing. Perhaps the artist felt that they didn’t have much time to capture this moment. There is little attention to detail. Elongated candles, rosary beads placed in her hands across her chest, a Madonna and child statuette watching over, all hastily, but adequately recorded for posterity. Evident in the calibre of the drawing of the woman’s features, this is a professional artist in my opinion, this is no amateur. The artist’s skill is effortless. And this is what my gut was telling me. If it is what I hope it is, then this is the most thrilling piece of artwork I own. I have a notion that this could be (and I live in hope of it being…) someone who followed, or perhaps even had close ties to, the Pre-Raphaelite Brotherhood (PRB). The style is undeniably similar to theirs. I have seen the pose of the embracing couple of the left panel before in a Pre-Raphaelite painting. But for the moment I can not recall which one. Perhaps copied? I had a mild obsession with the PRB all throughout my 20’s and 30’s. I used to curse my lank, baby fine locks, yearning for the thick, flaxen tresses of the medieval maidens so frequently portrayed in paintings by artist such as Rossetti, Holman-Hunt, and Waterhouse. I feel that the decision to add the oak frame and side panels came later. What was originally a spur of the moment, hurried, but poignant sketch, finally commanded a grand enclosure befitting its significance. The style of the front panels, the triptych arrangement, are all reminiscent of medieval alters. Medieval themes were common in Pre-Raphaelite works. But it’s not clear whether the same artist who created the sketch, made the frame or painted the figures on the inside panels, as the styles appear slightly different. 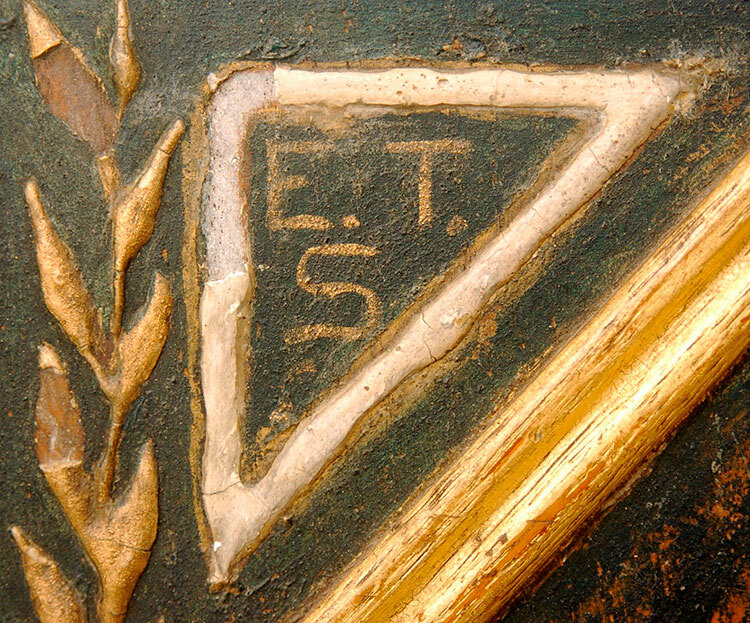 No signature could be found anywhere on the frame or the drawing, but the corner segments of the front panels display the initials E.T.S. and the date Sept. 28 ’98. Surely two great leads? But a wasted evening on Google did not bear fruit. 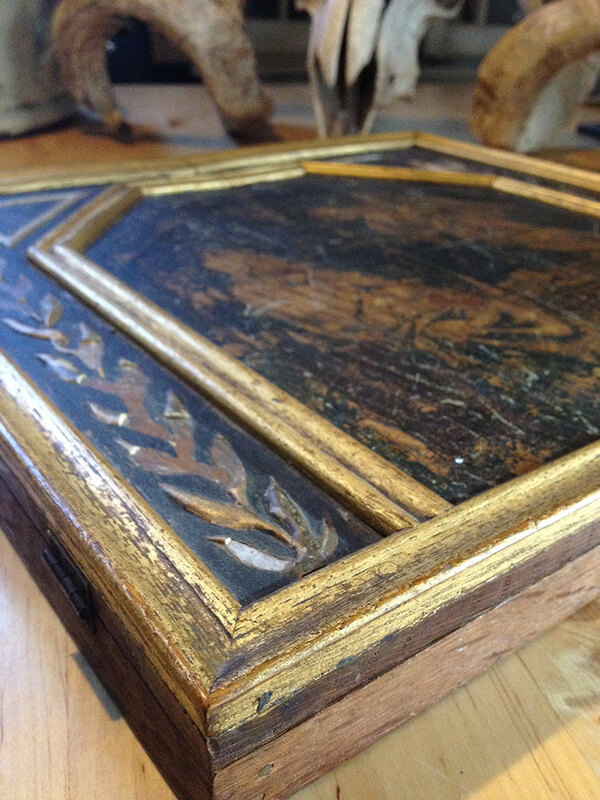 The only information the seller could offer, was that it was part of a lot she bought at auction, which had belonged to a collector in Edinburgh. 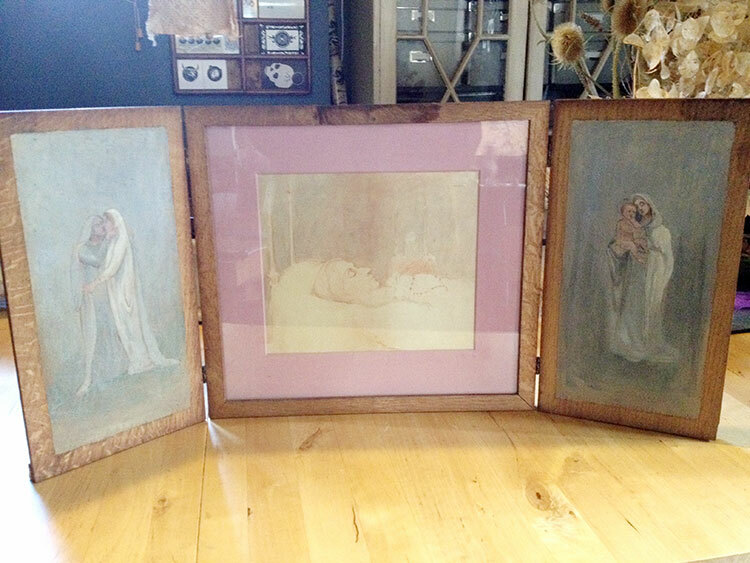 If there are any art detectives out there…I need your help. Yes I’d love to know the artist, or artists. So intriguing. But I suspect that would take some expert knowledge!